This beginner/intro scuba dive experience is great for those who are never dive before or not confident swimmers but would like to experience the underwater world. If you can’t swim, don't be afraid, here you will able to explore the Bali marine life. Enjoy a fun and easy dive for beginners with a dive master to see tropical fish with no experience required. All safety equipment, and hotel pickup and drop off in selected areas included. Tanjung Benoa - Nusa Dua is the place to doing water sports. Here is the place to do the scuba diving experience, all safety diving equipment and dive master will be provided. Great experience, Equipment is top notch and actually better than at the dive centre where we tried pool diving in the UK. Instruction before you get in open water is quite brief so Id recommend being familiar with snorkelling at least before trying this. Got to feed some of the fish and spent a good amount of time in open water. Saw a small boat wreck. Your instructor is always next to you so this feels perfectly safe. 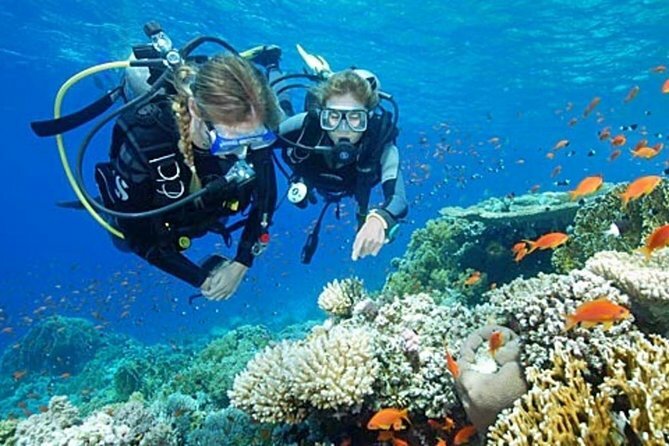 For the money and before you consider getting a PADI this is a great first experience. Be aware that the same centre offers most other water sports so we ended up doing parasailing at a modest extra cost and our transfer back was simply extended seamlessly.